Finally everything has progressed to the point where I can produce a standard 12°Plato (1.048) wort which will be used for each batch propagation and mini-fermentation throughout the Brettanomyces Masters Project. 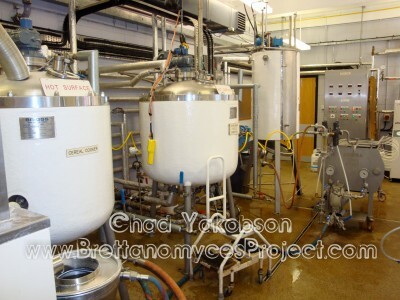 The ICBD pilot brewery is a custom built brewery which produces two hectoliter (200 liter) batch volumes. The grain bill for the brew was simple consisting of 100% lager malt supplied by Crisps Maltings, UK. Instead of brewing with the often standard British mash-tun and conducting a single infusion mash we produced the wort using a mash filter from Muera. 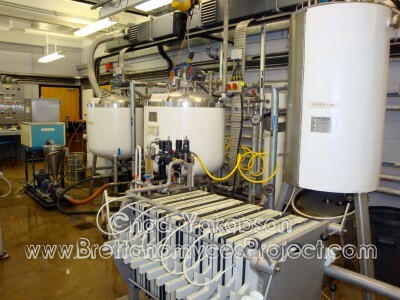 The mash filter is slightly different as the malt is ground finely with a hammer mill and mashed into a mash mixer for conversion of enzymes. The mash is then pumped over to the mash filter where strong worts are first extracted and then water from the hot liquor tank is sparged through the filter plates/screens for collection of the remaining sugars which run-off into the kettle. The wort was hopped to 22 IBU’s using German Hallertauer Magnum hops with a 60 minute boil. After boiling the wort and whirlpooling had commenced, the wort was cooled through the heat exchanger and collected into about 100, two liter sterile containers to freeze for continual use throughout the project. Hey look it’s the ICBD!